In 1962, Paul Hogarth was an established artist with a distinctive watercolour style. 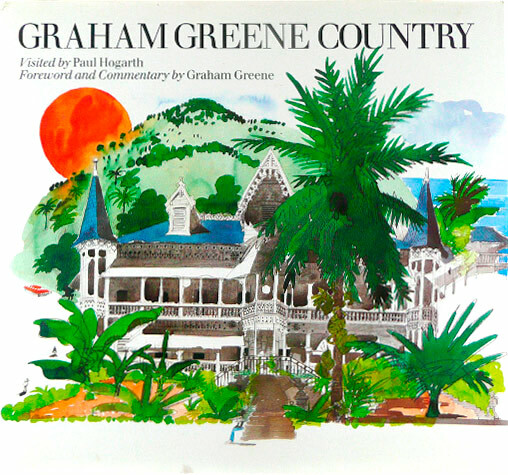 He had worked in collaboration with literary artists, including Brendan Behan, so it was natural for him to illustrate the covers of a new edition of sixteen Graham Greene novels. The Hogarth Greenes are a notable series in Penguin history and were one of the early successes of the Marber grid. This new design layout enabled Penguin to maintain its typographic branding while introducing eye-catching cover art. Hundreds of thousands of the Greenes were were sold. The series started an association between Penguin, Greene and Hogarth that lasted for many years. Despite his long career and considerable reputation Hogarth is possibly still best remembered for his Penguins Graham Greenes of the 1960s. In the mid 1980s, Hogarth travelled 50,000 miles to draw the locations of Greene’s novels. His pen and ink watercolours were published in this impressive book published by Pavilion in 1986.